It has to be almost 20 years ago when my husband, Patrick, and I worked on the Rockford Fourth of July Committee. One of the “needs” of the committee was a sound system for the Flag Retirement Ceremony that John Southerland, also on the Committee, was heading up since he was a Scout Leader. Patrick and I owned McG Sound and we traveled the country setting up sound for air shows. Patrick was impressed that John was teaching the Boy Scouts how to respectfully retire worn flags so he was quick to say we would be there. After Patrick’s death in 2008, friends helped me with air shows and with this Ceremony. A few years ago, Inis and Buzz Bloomster took the lead on setting up the sound and the Daughters of the American Revolution made the Ceremony something they sponsored each year. I still went along and helped. It is one of the most moving ceremonies I have seen. John reads, or has the boys and girls read, poems and facts about the flag while three to four thousand flags are disposed of in a solemn manner. We play quiet music in the background as the flags are burned one by one. This happens every July 3rd by the Symbol on North 2nd Street. My love for photography started when we belonged to the Northern Illinois Corvette Club. I would photograph license plates from around the country that were unique before Illinois started the program. I took “odd” shots of cars at shows – fenders, paint jobs, suspension, wheels – along with the whole car. Anything that was a bit abstract was fair game. For a time flowers, leaves and trees were my main subjects. I like objects more than people. People tend to pose and are not usually their “real” selves when pictures are taken unless you can catch them off guard. So it was on July 3, 2013, I was taking object pictures. 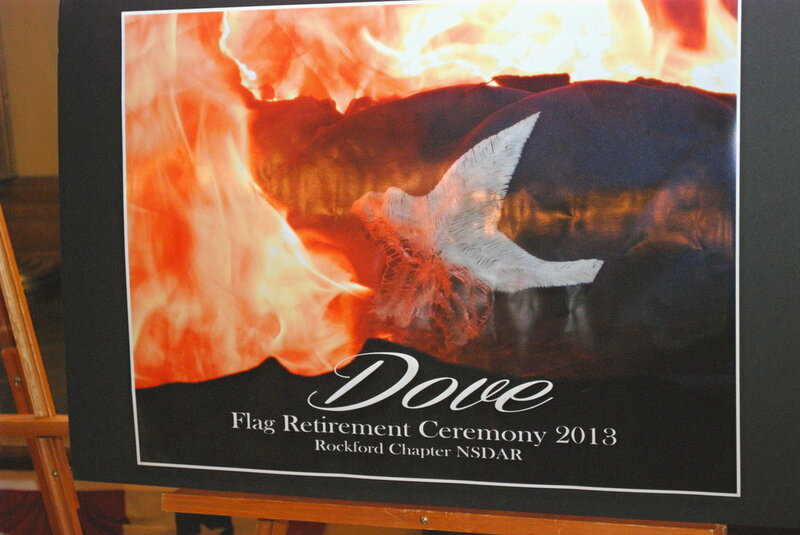 “Dove” is a picture of a star on a garrison flag, the kind that you see at the roundabout on Auburn or at Perkins on East State. These flags are so large that you have to take them apart to burn them. John had gone through what each stripe stood for as they were burned and the union was placed in the fire. I took at least 5 pictures of the flames as they devoured the flag. It wasn’t until later as I sat, looking at the pictures I had taken, that I saw one of the stars on the burning flag turned into a dove as if to say, “My mission is not finished, yet!” I saw the image right away but many people have to look at it awhile before they realize it is a star on the flag. It was just one of those happy moments that digital film catches because you can take pictures faster and you can erase your failures. ​This picture was sent by the Rockford Chapter NSDAR as an entry in the State American Heritage Contest and it won 1st place. 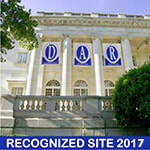 It is being considered for placement in other DAR events on the National level as well. My dove star is still flying. Photography is a fun hobby and the flag is one of my favorite subjects. If you have never seen a flag retirement, check with the local Boy Scouts of America or the Vietnam Veterans Honor Society for information concerning flag retirement ceremonies. It’s a patriotic and historical thing the whole family can do, and it teaches us all proper flag etiquette.